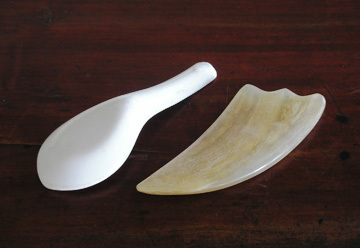 Gua Sha is a healing technique used throughout Asia. Gua means to rub or friction. Sha is the term used to describe congestion of blood at the surface of the body. When friction is applied in repeated even strokes, the sha surfaces as small red petechiae. In minutes the petechiae fade into echymotic patches. The sha disappears totally in two to four days. The color and rate of fading are both diagnostic and prognostic indicators. Gua Sha is a common treatment for upper back and neck tension and pain. Below is an example of the petechiae or ‘Sha’ that surfaces during the treatment. As the muscles and tissue heal, repeated treatments will show less ‘Sha’ until eventually none arises. This usually happens with 3-4 treatments and is a sign that the area has completely healed.